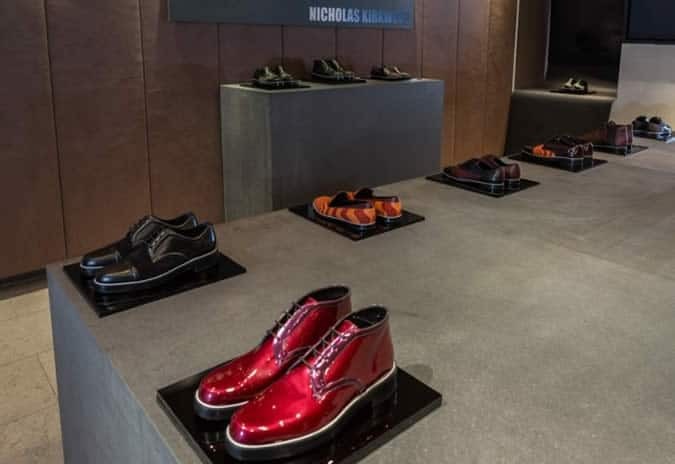 The first ever collection for men by designer Nicholas Kirkwood launched on Tuesday 8th January, and previews have promptly flooded Twitter. The women’s footwear designer, who recently created footwear for Meadham Kirchoff and Erdem shows, takes the decision to branch out into men’s shoes as he enters his eighth year of professional design status, after graduating from Central St Martins and Cordwainers, and launching his eponymous debut collection in 2005. “They are still very much based on your classic men’s shoe,” he explained. There will be a large focus on the materials utilised for construction, following the popular aesthetic formula that made his women’s designs so sought after. Successful formats from previous women’s collections are reworked, and include sumptuous suedes, leathers and calf-hair finishes. The most expensive shoe in the collection is priced at £590, whilst the cheapest pair can be bought for £322. Shoes range from Oxfords to slippers to dress shoe/sneaker hybrids, with a prominent colour palette of black, navy, ice blue and silver metallics. According to Kirkwood, they are “for the guy whose girlfriend is wearing my heels”.